One of our most intriguing questions has been whether the supposed endemic São Tomé shrew, Crocidura thomensis, is really endemic, found nowhere else in the world. This would suggest that its ancestor arrived on the island by natural means (rafting?) a long, long time ago. The alternative (and more likely) hypothesis is that it was brought to the islands, perhaps inadvertently, by the Portuguese during their 500 years of intense commerce on the islands, and the scientist who described it as unique was in error. This is an important issue, because mammals, with the exception of some bats, are notoriously poor over-ocean dispersers because they are endotherms, needing to maintain a constant body temperature. 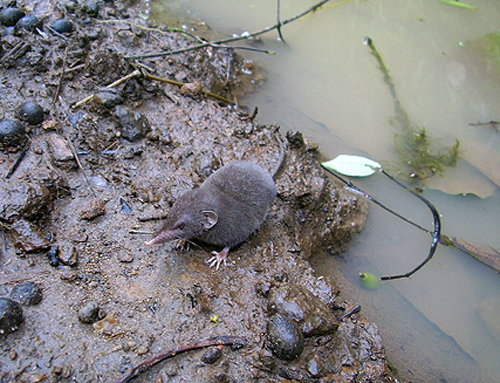 Moreover, among mammals, the very worst candidates as island colonizers are shrews. A shrew’s metabolic rate is so high that it must eat every four hours or die from heat loss; thus no competent biologist would predict the presence of such a creature surviving an extended crossing to colonize an oceanic island. Crocidura thomensis was originally described in 1887 by J. V. Barbosa du Bocage, the curator of Zoology at the Museum of Natural History in Lisbon. He based his description on anatomical features such as the large size of the shrew’s feet and ears as well as the particularly long snout. We decided to do a molecular (genetic) test of Bocage’s hypothesis that C. thomensis is found only on Sao Tome and nowhere else in the world. Thanks to the kindness of our friends from the Ministry of the Environment, Arlindo Carvalho, Vitor Bomfin and Salvador Pontes, we were granted permission to receive some shrew specimens collected by our colleague, Ricardo Lima of Nova Moca and to export them to the Academy where Eden did DNA analysis of them. She also included two shrews we collected on Príncipe during GG II (2006). These have long been thought to be an introduced mainland species. Eden was able to take advantage of a massive molecular study published three years ago by Dr. Sylvain Dubey of the University of Lausanne and his colleagues. Dubey’s study included 139 members of the shrew Family Soricidae from all over the world, but of course he lacked examples of our island shrews. Eden contacted Dr. Dubey, who was most helpful, and she was able to use the same four genes in her analysis that Dubey used in his larger study. 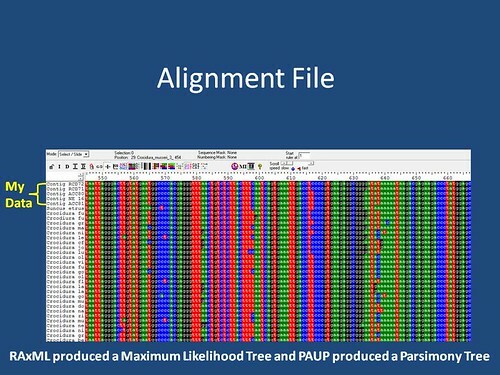 Below is an image of the alignment of the DNA sequences of Dubey’s samples together with our island samples. Shrew DNA sequence alignment. E. Maloney construct. Above is a cladogram, basically a picture of relationships- it includes the majorityof Afrotropical species and most Asian species that Dubey sampled, plus our island critters. Each line represents a species (or sample), and the lines that are joined together at the base (node) represent species (samples) that are each other’s closest relatives. The blue arrow is C. thomensis, our São Tomé shrew, the red is our Príncipe samples. 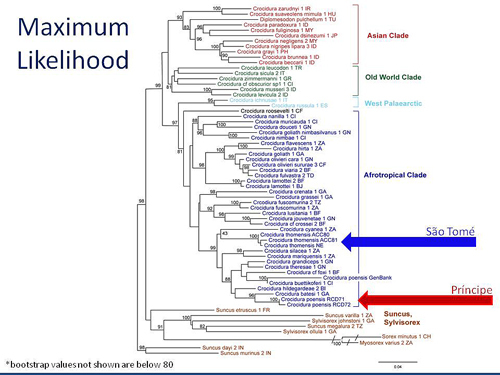 While both are members of the same subset of the Afrotropical clade (related groups of lines), note that they are only distantly related to each other. There a number of lines (species) between them, and there are a number of distinct lineages (clades) within the Afrotropical group. Above is a representation of Eden’s Afrotropical Clade III, therelated group within the broad African species clade that includes both our island samples. Our São Tomé species samples are in the red box, and notice that their nearest relative is a mainland species called Crocidura cyanea, a shrew that ranges from Angola, Botswana and Mozambique south into South Africa. C. thomensis is genetically distinct enough from this (it’s nearest relative) and all other species in the tree for us to say with confidence that it is a true endemic. From this we infer that the common ancestor of C. thomensis and C. cyanea somehow reached the island a long, long time ago, long enough for it to have been isolated from the mainland for a great enough period of time to have accumulated enough genetic change so that it is now recognizable as a distinct species. Assuming that our study is accurate and our analysis is correct, Crocidura thomensis is the Gulf of Guinea oceanic islands’ only endemic terrestrial mammal. We are not quite ready to publish these results though. 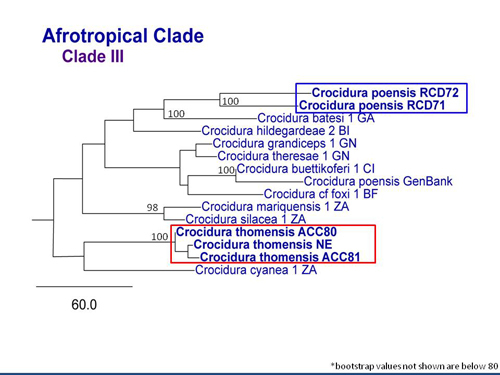 There is still the problem of the two Príncipe samples, called C. poensis (blue box in the Afrotropical cladogram). The shrews on this island have long been thought to be this particular mainland species but the name is an assumption on our part; there are some missing sequences of C. poensis in Dubey’s study, and until we can clarify the situation, we do not know the correct name for the Príncipe shrew; it is probably either C. poensis or C. batesi, both mainland forms. However, the genetic differences between our Príncipe samples and the other species in Afrotropical Clade III are so small as to strongly suggest that the species is not endemic but rather a recent arrival. Ricardo Lima in Europe; unknown phot. 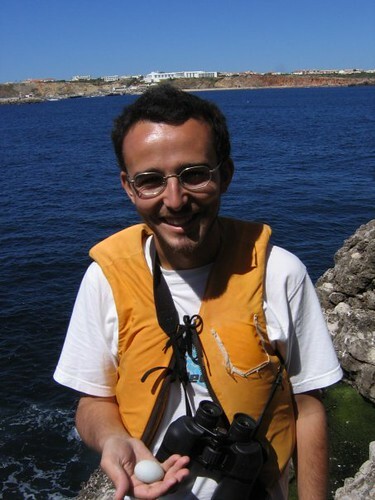 Ricardo not only re-discovered the São Tomé shrew (incorrectly thought to be rare), he has also learned more about this species that has ever been known before. 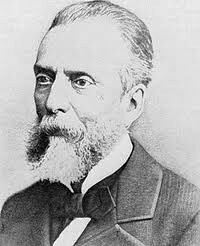 He has made and plotted numerous sightings of the species during his fieldwork and has been able to learn a great deal about its abundance and natural history. So, Eden, Ricardo and I will collate his ecological data with our genetic data and publish our results when the remaining issues are all resolved. One other item: I have suggested, perhaps rashly, that Crocidura thomensis may be the only endemic oceanic island shrew in the world; further investigation is needed. 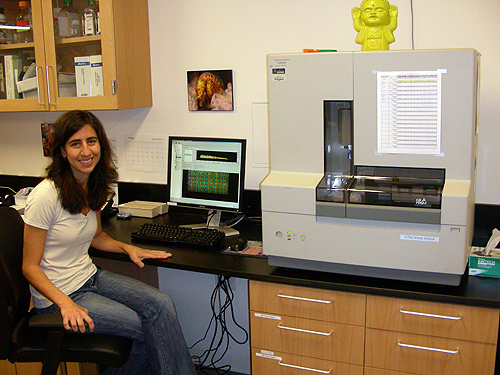 Anna Sellas, Lab Manager, Center for Comparative Genomics; RCD phot. 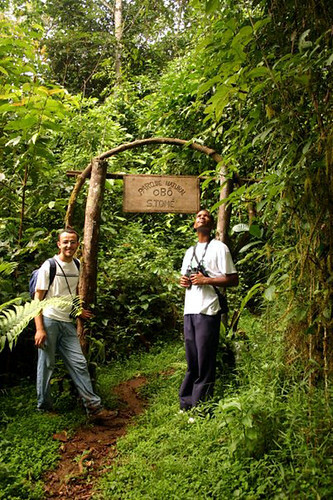 We are able to ask and answer such finely-tuned, detailed questions of genetic distance about the unique biota of São Tomé and Príncipe because we have the appropriate tools and wonderful people in our lab. The Center for Comparative Genomics is an integral department of the California Academy of Sciences. Headed by Dr. Brian Simison, the lab is managed and run by Anna Sellas, a fine biologist and most able teacher of molecular techniques. 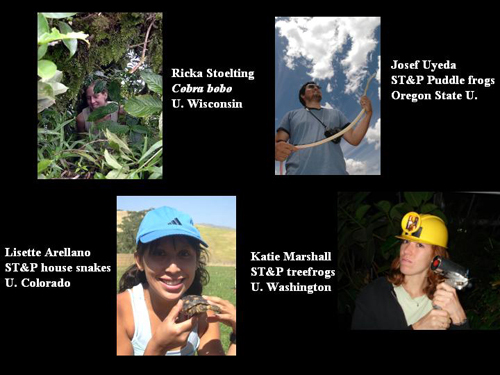 Dana Carrison, a member of GG III who did her MSc on island barnacles also works in the lab and greatly assisted Eden. 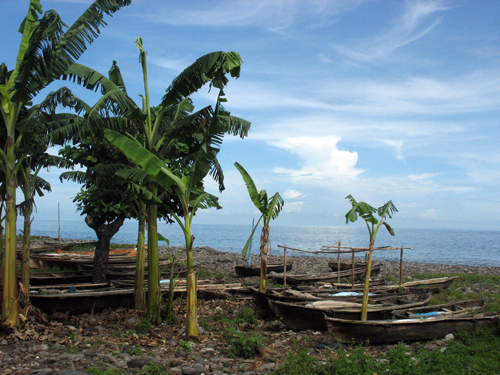 A number of our interns and grad students who have worked in the field with us have done their analyses of São Tomé and Príncipe projects in the CCG. Four of mine, I am enormously proud to say, have entered or completed doctoral programs– they appear above. Some of their projects have been published, the rest are still in preparation. Brilliant! How exciting, well done Eden, and good luck with the rest of it! Previous Previous post: The Race: Nightmares, Explosions and Geographic Origins. Next Next post: The Race: A New Mammal Species for Principe!